The Kentucky Symphony Orchestra debuts swinging subsidiary group at 21st Annual Valentine’s Day Gala. The "Charleston" meets the "Zoot Suit Riot" on February 14th, as the KSO's Newport Ragtime Band opens for the premiere performance of the Covington Devou-Doo Daddies. It is an ideal date night where patrons can dress in era attire, enjoy cocktails, dinner and dancing all to support the KSO's free summer park concerts and education programs in the schools. Kathy Wade with the KSO's Newport Ragtime Band. This year’s Kentucky Symphony Orchestra's Valentine’s gala marks the debut of its newest subsidiary group. The Covington Devou-Doo Daddies will join the KSO’s roster of authentic acts dedicated to preserving America’s musical heritage via live performance. 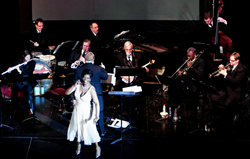 Through the use of subsidiary groups like The KSO Boogie Band (a 20-piece studio orchestra with vocals), the Flood Wall Jazz Quintet and the Newport Ragtime Band (a 9-piece ensemble), the KSO has become an integral part of the Northern Kentucky community. These smaller groups allow the KSO to offer unique high quality entertainment to fit the venues and budgets of municipalities and private functions. KSO Music Director and founder James Cassidy said, "All of the KSO's off-shoot groups comprise the Tri-state's finest specialized musicians. Each group is tasked with performing, with the authentic style and sound, the hit tunes of each genre and era. The songs are fabulously captured in the original charts or in the many great arrangements / adaptations penned by the KSO’s two exemplary orchestrators — Terry LaBolt and Scot Woolley. KSO subsidiary groups are often named after area locales enhancing the ties to Northern Kentucky where the orchestra is based. Covington Devou Doo-Daddies refers to the park in Covington, KY where the KSO has performed a free summer concert series for the past 20 years. The Newport Ragtime Band began covering the ragtime and jazz music of Scott Joplin, Jelly Roll Morton, James Reese Europe, King Oliver and others beginning in 1997. It expanded its reach by offering a Black History Month program titled “Rags to Riches” for Middle and High School students. The need to expand the repertoire allowed the group to uncover local names from the era (Artie Matthews, Fats Waller) as well as exploring what was happening across the country, with regard to blues, Dixieland, stride and early jazz. The group even added some Vaudeville acts (Al Jolson, Boswell Sisters). The Covington Devou-Doo Daddies grew from the idea of linking to the next era — swing. Instead of the '30s & 40s however, the group jumped 60-70 years ahead to the "swing revival" that occurred in the 1990s with great acts like Big Bad Voodoo Daddy, The Cherry Popping Daddies, The Squirrel Nut Zippers and others. Cassidy said, "By simply adding a reed and trumpet to the Newport Ragtime Band, the band could bring hits like "Zoot Suit Riot and Jump Jive & Wail" roaring back to the dance floor at the Newport Syndicate. You just can't sit still to this music." The Covington Devou-Doo Daddies premiere coincides with the KSO’s sole annual fundraising event. On Saturday, February 14th everyone is invited to celebrate Valentine's Day, circa 1920s and 1990s in the same evening. The event begins at 6:30 p.m. with a cocktail hour allowing flappers and wise guys the chance to chat with friends and browse a killer silent auction before a savory three course dinner with wine. To work off a sinful dessert, the Newport Ragtime Band with vocalists Kathy Wade, Deondra Means and Troy Hitch will light up the dance floor with tunes of Prohibition, from WLW’s and Newport’s hey-day. Then the room spins, jumps, jives and wails to the sounds of the KSO’s new Covington Devou-Doo Daddies. “Jump Jive an’ Wail” marks the KSO’s 21st Valentine Gala. Over the years these parties have become a hit, while raising support for the KSO’s unique, educational and family friendly offerings, provided free to schools and to the community in Devou Park. The killer auction features exciting travel, arts, sports, and dining experiences as well as much sought after merchandise — from hotels in Paris or Crete to NCAA Men’s Final Four basketball tickets or use of a private corporate suite at a Cincinnati Reds Game. Two raffle drawings will also take place during the evening. For just $10 a chance, the “Stay Anywhere in the World” Raffle includes one-week accommodations of the winners choosing from over 7,400 locations throughout the globe. A $500 Macy’s gift card chance is available for $5 each. Winners need not be present to win. Those unable to attend the event can bid on auction items or purchase raffle tickets on-line. Parties on this scale don't happen without great neighbors, businesses and firms. The KSO is thrilled to have long standing partners Toyota, Macy's, HermanMiller, GBBN Architects, Gateway Community & Technical College, VSR Financial Services, Barnes-Dennig and Harvey Marshall Berling, plus newcomers I-Wireless, Strauss Troy Attorneys, all helping to support the KSO’s educational and outreach efforts. So, “Go Daddy-O” and “Mambo Swing” with your “Toot-Toot Tootsie” or “Charleston” with “Mr. Pinstripe Suit” down to Newport’s spiffy speakeasy for KSO “Zoot Suit Riot!” Admission includes 2 cocktails, dinner, dessert, wine and dancing to live music. Tickets are $125.00 per person, $50 of which is tax deductible. Reservations must be made in advance by contacting the KSO at (859) 431-6216 or purchasing on-line at kyso.org/annual-gala. About the KSO: The Kentucky Symphony Orchestra takes the “phony” out of symphony through its varied and thematic concerts, which culturally enrich, educate and entertain the residents of Northern Kentucky and Greater Cincinnati. The KSO performs throughout Northern Kentucky performing three series of concerts, for the schools, in the parks and at various indoor venues.